It goes against all the instincts of a public relations specialist to turn down a media opportunity. Yet despite the adage that all PR is good PR, there are situations where the disadvantages of speaking to a reporter far outweigh the gains. We don’t recommend an adversarial or “no comment” response, which is usually counterproductive. Instead we advocate taking a thoughtful look at all media inquiries to determine if they advance a company’s goals. And when they don’t, or worse, when a resulting story could cause harm, there are ways to manage the situation. When the story direction is questionable. Sometimes a journalist takes a media pitch and goes in a completely different direction with it, to suit an editorial agenda, or simply because it’s a good story. A team pitches a new technology product, and the reporter decides to focus on threats to the category without attention to the product’s attributes. Or he approaches a company with a story in mind, and in the first discussion that angle has been replaced by a controversial one in a kind of bait-and-switch. This is why most PR people work to get potential questions in advance, which can help determine if the interview is worthwhile. Additionally, research into the reporter’s previous stories can add insight, although it pays to remember that many story decisions are driven by editors. 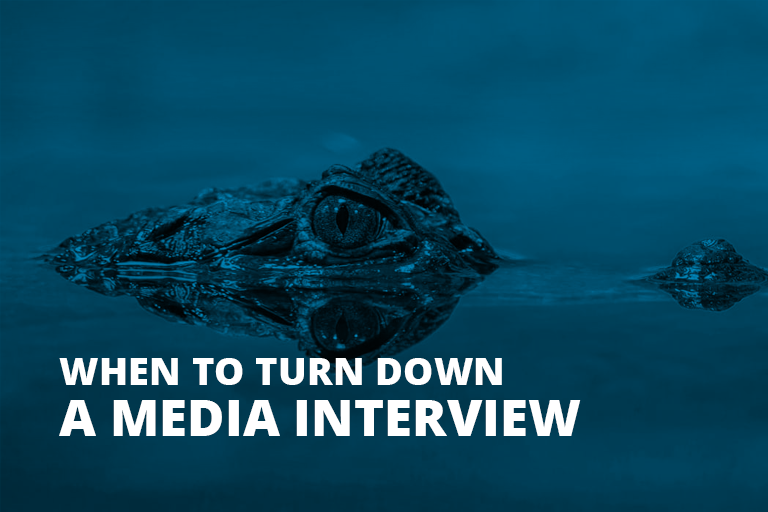 Sometimes the interview process is a long courtship where the reporter spends weeks or months gathering background, during which the PR team can assess its potential. If the interview process moves in a negative direction, it can be smart to withdraw tactfully. But if a journalist is bent on doing a story, we’ll often line up sources and recommend proceeding cautiously, for the simple reason that it’s often better to participate than be left out of a piece you can potentially influence. When the story may have unwanted ramifications. Sometimes the story is positive, but the ramifications may be mixed. I was recently asked for advice from a colleague who works with a fledgling NGO helping refugees. A TV station had requested an interview with one particular family being helped locally. Although the reporter made it very clear that the story was to bring a local angle to an international crisis, here was the dilemma: Grant the interview to raise awareness and, potentially, donations and volunteerism; or risk the family’s privacy, possibly awakening critics. Our counsel here was to politely decline while offering a future story when the group had more advocates and was more established. We helped the journalist with alternative sources to maintain a positive relationship and leave the door open for future interaction. When the spokesperson isn’t up to the task. Sometimes, despite all best efforts, a company is unable to offer an ideal spokesperson for a media interview. Some are nervous or defensive, or they may not be familiar with the subject matter. Even a well-intentioned effort by an underprepared spokesperson can result in evisceration by determined reporters. The remedy for these situations is rigorous spokesperson vetting and professional media training that preps for all types of media interviews. These include simulated interviews with an unprepared reporter, a “nasty” journalist, or an inscrutable one who doesn’t show his hand. A good media prep session will help keep things on track, and videotaped simulations are helpful learning. Yet there are some people who are just not cut out for the job, and in those cases it’s best to invest in an alternative spokesperson or to opt for email interview questions. Despite the best preparation, sometimes things go awry. But this recent interview featuring a BBC interviewee interrupted by his kids is not only a terrific example of grace under pressure, but a reminder that we’re all human, and some “mistakes” aren’t mistakes at all. When the timing is off. This is the most common situation, and it’s one that typically has a positive resolution. The good news is a journalist has gotten wind of your company’s new product, financing or acquisition. But it’s complicated, because talking about it too early could jeopardize the big announcement. Or management is undergoing some confidential changes and talking now just isn’t advantageous. Most PR people have reasonably trusting relationships with journalists, making it easy to offer an honest explanation and asking for more time. Any reporter will respond to a sincere offer of a first-crack interview within a reasonable period, but offer only what is ironclad. When the outlet is questionable. A top-tier publication may contact the PR team with an inbound request, and it’s a terrific opportunity that falls into our lap. At other times, it’s a less reputable media outlet or one that is simply too small to spend executive time on a lengthy interview. These can be delicate situations, because a reporter starting out today at a niche blog can be tomorrow’s managing editor at an influential news organization, and it doesn’t pay to ruffle feathers. A polite decline is often in order, unless an email question and answer can be managed with help from the PR team.